Navratri, the festival of 9 nights is one of the most magnificent festivals of India that is celebrated with all grandeur throughout the country. 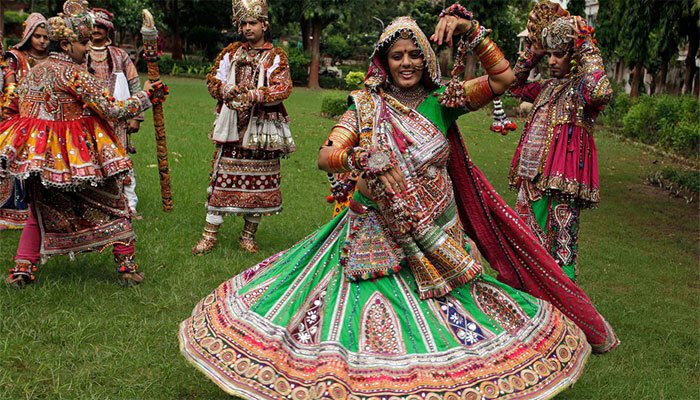 From North India to South India, from East to West the festival of Navratri is celebrated with the same zeal. Generally falls during the month of September or October that completes on the 10th day with the celebration of Vijayadashmi / Dusserah that marks the day as a victory of good over evil. Gujarat, the western state of India surrounded by huge water bodies and is having its own charm when it comes to festival celebration. Navratri is one of the major festivals that celebrate in here. 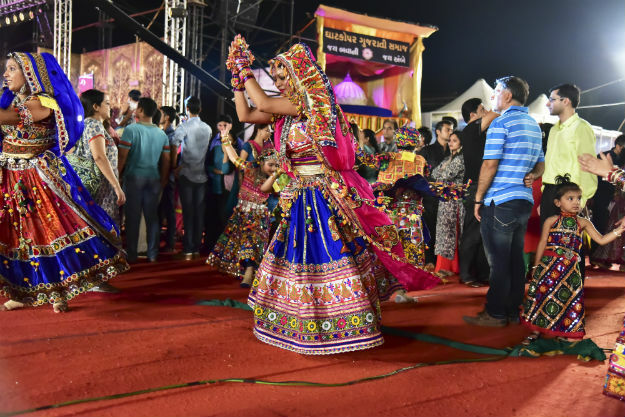 People here dancing to the tunes of garbha with dandiya and lamp in the hands and that makes the whole place comes alive during Navratri. 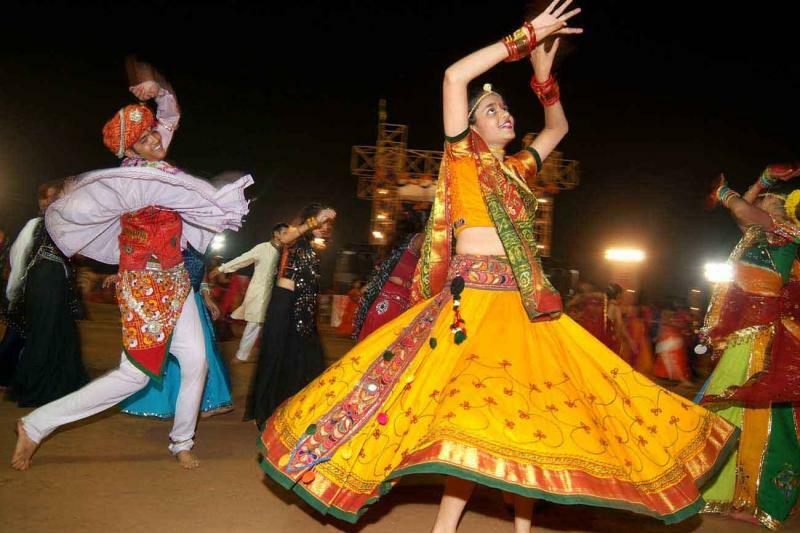 Be it the major cities of Gujarat such as Ahmedabad, Surat, Baroda, and Gandhinagar or be it the small villages of the state, each and every place get a dip in the celebration of music, dance, and food. Bengal culture and Navratri are an integral part of each other. Bengal during Navratri becomes the liveliest place on earth. Devi Puja keeps a prominent place in the life of the people of West Bengal. 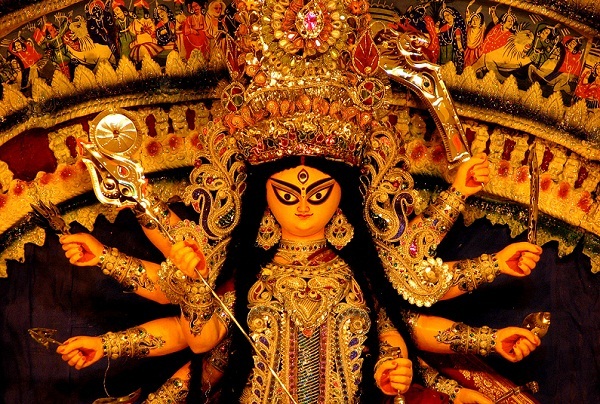 Navratri is known as Durga Puja in here and people follow different rituals during this time. The preparation of Durga Puja starts 1 week before the actual festival starts, one must see the streets, houses and the whole city comes alive during this time. On the last of Durga Puja, married women smear vermilion on each other as a sign of long and healthy life of their husbands. Durga idol immersed in water and ceremony completes with the beginning of Vijaydashmi. The ancient and holy city of Varanasi is amazing and often called as the mokshdwar (the gate of salvation). It is believed that Varanasi was established by Lord Shiva himself and thus one can see a huge impact of Shiva and Parvati in here. The celebration of Navratri festival is quite unique in here. 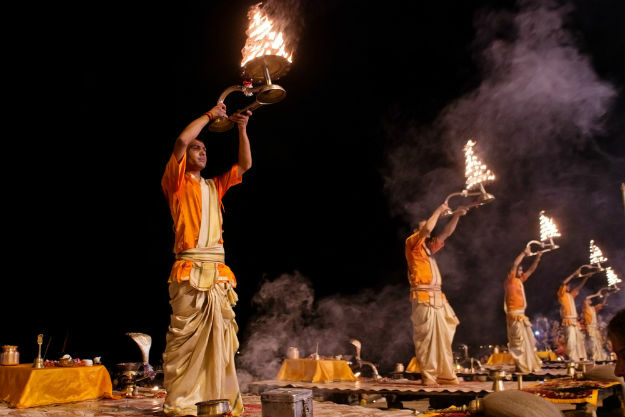 While being on your Golden Triangle Tours when you visit Varanasi, you will see that during these 9 days people celebrate by playing dance-drama based on Indian epic Ramayana. During this time Varanasi ghats come alive with the hustle and bustle of the people coming from various parts of the country and the world. The loud chanting of hymns, prayers, vibrant rituals, and maha Aartis makes Varanasi a divine place. A prominent part of North India tourism, Himachal Pradesh is one of the finest places to visit during your holidays. The state during the festival of Navratri becomes more admirable. If you wish to savor the real taste of the Navratri festival, you must give a visit to the Dhalpur Maidan in Kullu Valley that is considered as the epicenter of Navratri celebration. Lord Raghunath is worshiped in here. The idols of Gods and Goddesses are worshiped and are brought down with a magnificent procession. On the last of the festival, a devotee’s burns woods and grass on the banks of River Beas that is the symbolism of burning Lanka. The South Indian state of Karnataka is amazing and beautiful and is quite popular among travellers. Being a prominent part of South India tourism, Karnataka during Navratri festival basted with a grand celebration that marks the victory of good over evil. 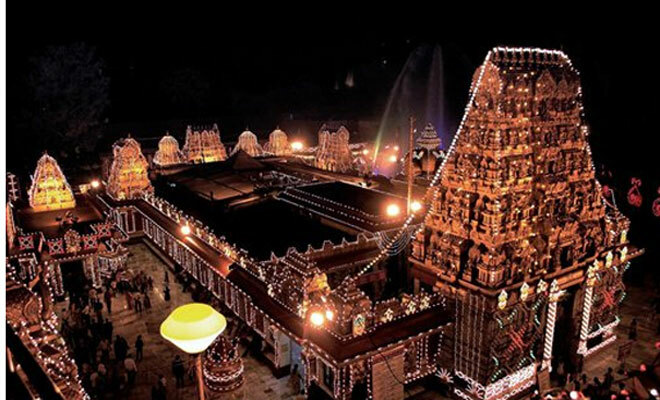 The whole city illuminated during the festival of Navratra and the famous Mysore Palace is decorated with more than 1 lakhs lights. Watching Mysore Palace highly illuminated will be a treat for eyes. On the last of Navratri festival, that is on Dussehra whole Mysore come to life. 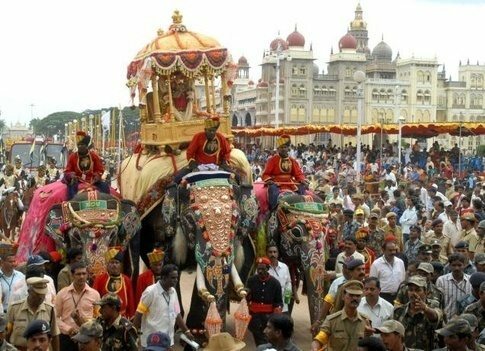 The spectacular procession of ornamented elephants on streets of Mysore showcases the royalty and ethnicity richness of Mysore. A magnificent idol of Goddess Durga, killing demon king Mahishasur is another major attraction of Dusserah. 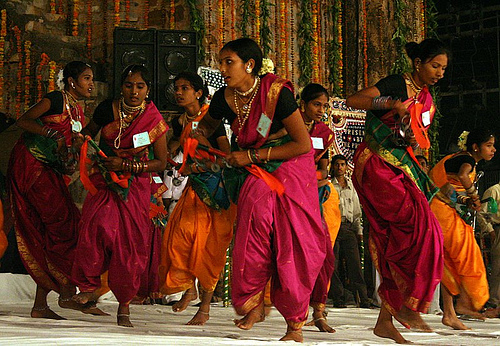 You must not have heard a lot about Chhattisgarh and its Navratri festival celebration. There is a tribal area of Bastar in Chhattisgarh that celebrates Navratri like no other place in the whole state. The celebration of Dusserah is something worth knowing. The festival is celebrated for 75 days in here and during this festival denizens of Bastar worship local Goddess Devi Maolialon with her sisters during Navratri. Devotees and priest during this festival come together at Danteshwari Temple which is located in Jagdalpur. The idols of temples are taken out on holy procession on a chariot. This chariot is prepared by local artisans using traditional tools. Jammu is quite a charismatic location and is famous as the house of Vaishno Devi Temple, one of the prominent Devi temples in India. Being the oldest and most visited shrines, temple Mata Vaishno Devi gets boasted with thousands and lakhs of tourists from all over the world. 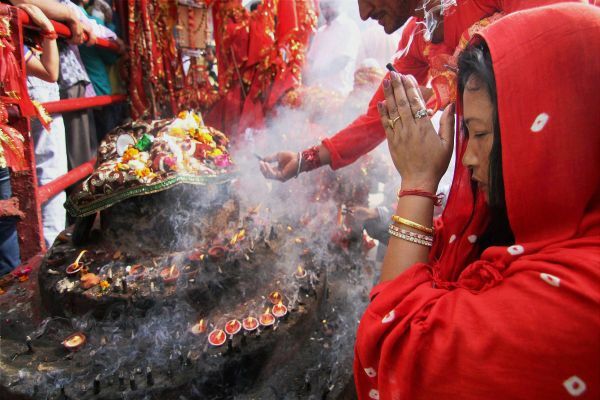 During Navratri festival, Katra becomes a holy pilgrim site that comes to life with all hymns, prayers, Aartis, and rituals. The air filled with the chants of “Jai Mata Di” boost up your spiritual soul. Delhi is a major part of north India tour packages. Being a prominent metropolitan city, Delhi is compacting with people from different cultural backgrounds. Thus celebration of Navratri festival is quite amazing to see. The last of the festival is celebrated as Dusserah which marks them as the day when Ram killed Ravana and thus a symbol three statues of Ravana, Meghnath and Kumbhkarana are burnt on Dusserah. Ram-Leela takes place for 9 days. With musical nights, vibrant grounds, people pack pandals and fascinating aura, Maharashtra during the festival of Navratri becomes travelers’ paradise. The capital city Mumbai is worth experiencing during this festival. People on their Mumbai day tours love enjoying the festival. The streets of Mumbai come alive with sounds, music, cuisines, and happy peoples. On the last of Navratri festival, devotees burn 10 headed demons named Ravana to mark the day of the end of evil and beginning of good.